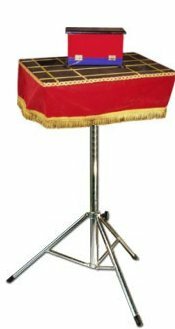 This wooden tabletop is covered with black felt, trimmed with gold ribbon and fringe, and has a beautiful red velveteen skirt. The top has one hidden "black art" well that enables a performer to vanish objects, produce them, and allow him to secretly ditch or drop items from his hand and out of sight as he picks up his wand or other apparatus. A well is also an excellent way to load a top hat, basket, or other receptacle. The top measures about 14 x 18 inches and comes complete with collapsible tripod Eureka Table Base. Everything packs relatively flat for transport. The table top is made by Chadwick Illusion Fabrications. Customization of this prop including color, positioning and number of wells, etc, is available upon request!